Congestion, seasonal allergies, cold and flu symptoms, sinus headaches all contribute to breathing discomfort. Symptoms can be relieved with herbal remedies. 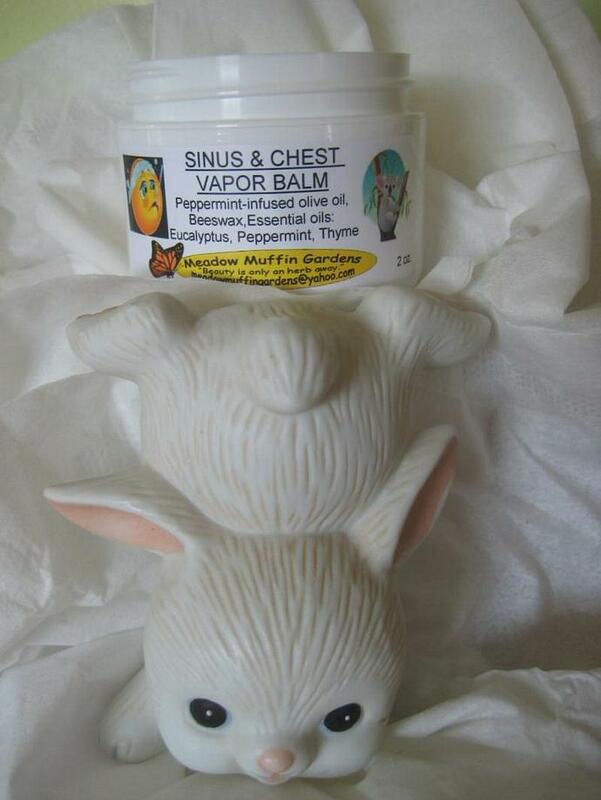 Our Sinus and Chest Vapor Rub can help fight infection and relieve sinus and lung congestion. If you look at commercial vapor balms,you'll notice they probably contain ingredients such as thymol, menthol, and eucalyptol. These are components of the essential oils: thyme, mint, and eucalyptus. 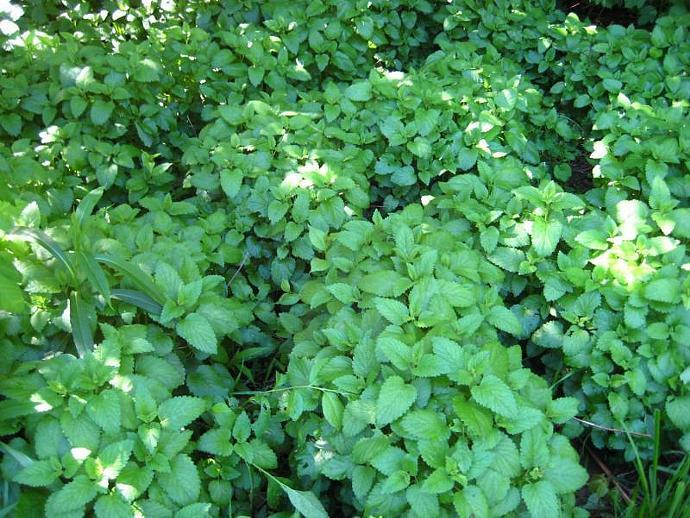 A common remedy often used is wintergreen (menthyl salicylate). Wintergreen is left out of our balm as menthyl slaicylate is similar to aspirin and we felt it best not to be included should the balm be used on children. Essential oils are concentrated and being peppermint, eucalyptus and thyme are on the safe list for children once they reach the five to seven age bracket (some sources say to wait till the eight to ten age bracket) it is advised to check with your physician before using on younger children. For younger children over age 2, Pine, Spruce, Fir, Cypress, Orange and Lavender are good alternatives that can be used for congestion. Let me know if you want a substitution. For children under the age of 2, it would be safest to use the inhalation method for congestion by way of herbal tea (not the essential oil) Peppermint tea, consumed, or just smelled, can help little ones with congestion. 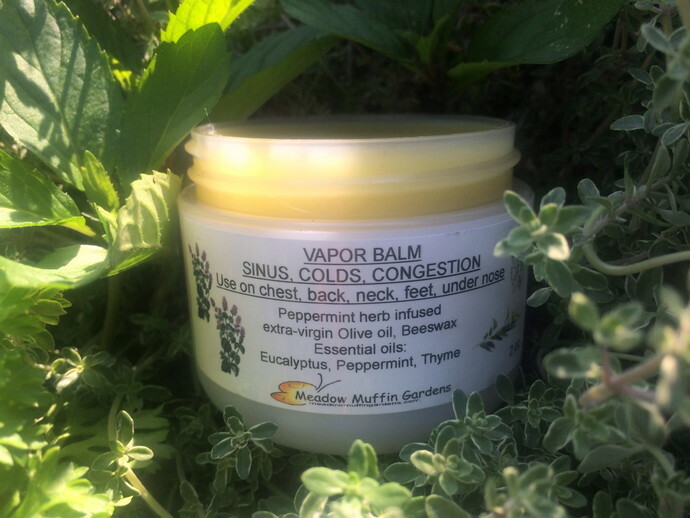 A very effective, alternate method of application enabling the thyme, eucalyptus and peppermint to reach the bronchial capillaries is to apply the balm to the soles of the feet. This is advised for young children who may find the balm's aroma too strong. 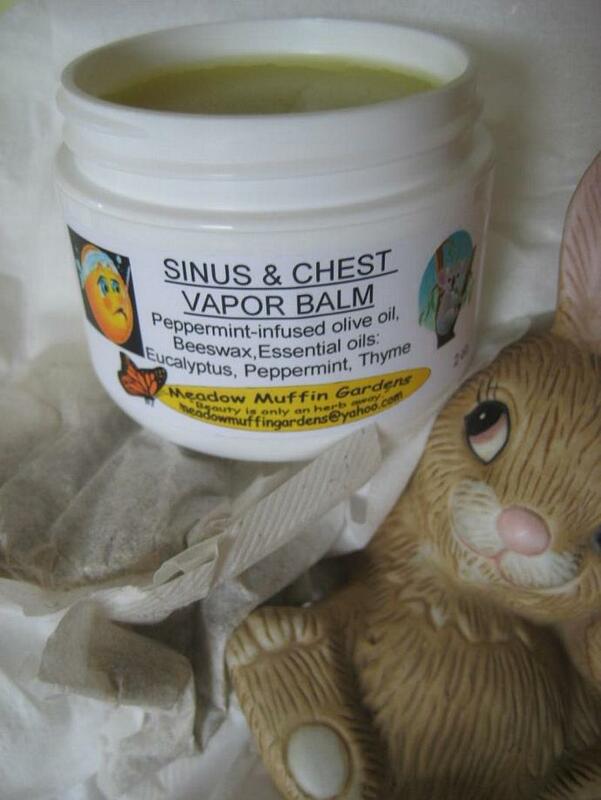 This vapor balm can be applied onto the chest, back or feet. Should you want to increase its warming action lay a warm piece of flannel over the area. An option to help open clogged sinuses is to apply just a bit under the nose. A viral infection has to run its course but if you help things along you may find it easier to breathe and lessen those headaches. If pregnant, check with physician before use.